frozen ground with a very low total water content consisting almost completely of interfacial water, and not cemented by ice. permafrost containing neither free water nor ice. 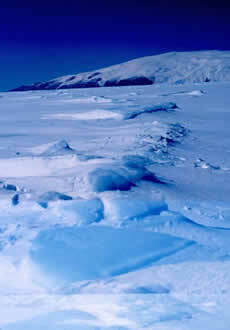 a mound or layer of moraine formed along the edge of a glacier by rock that falls off the ice; sometimes called a ground moraine. the ratio of stress to strain for a material under dynamic loading conditions. the absolute value of the ratio between the linear strain changes, perpendicular to and in the direction of a given uniaxial stress change, respectively, under dynamic loading conditions. a cold wind blowing down an incline; a kind of katabatic wind. bands of light and dark on a glacier that were formed by rock avalanching.